21 light-orange MARLISSA tablets, each containing 0.15 mg of levonorgestrel USP, (-)-13-Ethyl-17-hydroxy-18,19-dinor-17α-pregn-4-en-20-yn-3-one, a totally synthetic progestogen, and 0.03 mg of ethinyl estradiol USP, (19-nor-17α-pregna-1,3,5 (10)-trien-20-yne-3,17-diol), and 7 pink inert tablets. The inactive ingredients present in 21 light orange active tablets are FD&C Yellow 6, lactose monohydrate, magnesium stearate, polacrilin potassium, microcrystalline cellulose, povidone and talc. The inactive ingredients present in the 7 pink inert tablets are D&C Red 30, lactose monohydrate, magnesium stearate, polacrilin potassium, microcrystalline cellulose, povidone and talc. An increased risk of venous thromboembolic and thrombotic disease associated with the use of oral contraceptives is well established. Case control studies have found the relative risk of users compared to non-users to be 3 for the first episode of superficial venous thrombosis, 4 to 11 for deep-vein thrombosis or pulmonary embolism, and 1.5 to 6 for women with predisposing conditions for venous thromboembolic disease. Cohort studies have shown the relative risk to be somewhat lower, about 3 for new cases and about 4.5 for new cases requiring hospitalization. The approximate incidence of deep-vein thrombosis and pulmonary embolism in users of low dose (<50μg ethinyl estradiol) combination oral contraceptives is up to 4 per 10,000 woman-years compared to 0.5 to 3 per 10,000 woman-years for non-users. However, the incidence is substantially less than that associated with pregnancy (6 per 10,000 woman-years). The risk of thromboembolic disease due to oral contraceptives is not related to length of use and disappears after pill use is stopped. 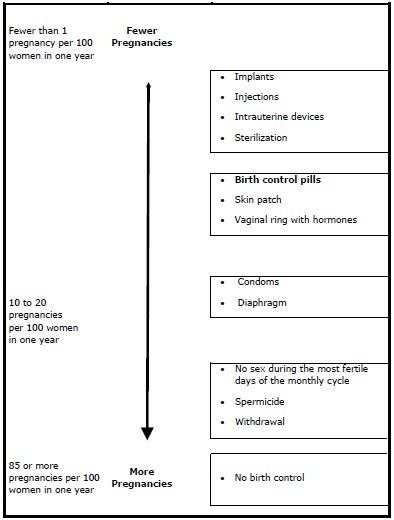 One study gathered data from a variety of sources which have estimated the mortality rate associated with different methods of contraception at different ages (Table III). These estimates include the combined risk of death associated with contraceptive methods plus the risk attributable to pregnancy in the event of method failure. Each method of contraception has its specific benefits and risks. The study concluded that with the exception of oral contraceptive users 35 and older who smoke and 40 and older who do not smoke, mortality associated with all methods of birth control is less than that associated with childbirth. The observation of a possible increase in risk of mortality with age for oral contraceptive users is based on data gathered in the 1970’s – but not reported until 1983. However, current clinical practice involves the use of lower estrogen dose formulations combined with careful restriction of oral contraceptive use to women who do not have the various risk factors listed in this labeling. During clinical trials with the Hepatitis C combination drug regimen that contains ombitasvir/paritaprevir/ritonavir, with or without dasabuvir, ALT elevations greater than 5 times the upper limit of normal (ULN), including some cases greater than 20 times the ULN, were significantly more frequent in women using ethinyl estradiol-containing medications such as COCs. Discontinue MARLISSA prior to starting therapy with the combination drug regimen ombitasvir/paritaprevir/ritonavir, with or without dasabuvir [see CONTRAINDICATIONS (4)].MARLISSA can be restarted approximately 2 weeks following completion of treatment with the combination drug regimen. Women with a history of hypertension or hypertension-related diseases, or renal disease, should be encouraged to use another method of contraception. If women with hypertension elect to use oral contraceptives, they should be monitored closely, and if significant elevation of blood pressure occurs, oral contraceptives should be discontinued (see CONTRAINDICATIONSsection). For most women, elevated blood pressure will return to normal after stopping oral contraceptives, and there is no difference in the occurrence of hypertension among ever- and never-users. The onset or exacerbation of migraine or development of headache with a new pattern that is recurrent, persistent, or severe requires discontinuation of oral contraceptives and evaluation of the cause (see WARNINGS, 1c.). Patients becoming significantly depressed while taking oral contraceptives should stop the medication and use an alternate method of contraception in an attempt to determine whether the symptom is drug-related. Women with a history of depression should be carefully observed and the drug discontinued if depression recurs to a serious degree. Reduced ethinyl estradiol concentrations have been associated with concomitant use of substances that induce hepatic microsomal enzymes, such as rifampin, rifabutin, barbiturates, phenylbutazone, phenytoin sodium, griseofulvin, topiramate, some protease inhibitors, modafinil, and possibly St. John’s wort. Substances that inhibit cytochrome P450 3A4 isoenzymes such as indinavir, fluconazole, and troleandomycin. Troleandomycin may increase the risk of intrahepatic cholestasis during co-administration with combination oral contraceptives. During the first cycle of medication, the patient is instructed to begin taking MARLISSA on the first Sunday after the onset of menstruation. If menstruation begins on a Sunday, the first tablet (light-orange) is taken that day. One light-orange tablet should be taken daily for 21 consecutive days, followed by one pink inert tablet daily for 7 consecutive days. Withdrawal bleeding should usually occur within three days following discontinuation of light-orange tablets and may not have finished before the next pack is started. During the first cycle, contraceptive reliance should not be placed on MARLISSA until a light-orange tablet has been taken daily for 7 consecutive days and a nonhormonal back-up method of birth control should be used during those 7 days. The possibility of ovulation and conception prior to initiation of medication should be considered. For additional patient instructions regarding missed pills, see the “WHAT TO DO IF YOU MISS PILLS” section in the DETAILED PATIENT LABELING below. If breakthrough bleeding occurs following missed light-orange tablets, it will usually be transient and of no consequence. While there is little likelihood of ovulation occurring if only one or two light-orange tablets are missed, the possibility of ovulation increases with each successive day that scheduled light-orange tablets are missed. 21 Active Tablets: light-orange color, round, biconvex, uncoated tablets with ‘A5’ debossed on one side. 7 Inert Tablets: pink color, round, biconvex, uncoated tablets with ‘A6’ debossed on one side.